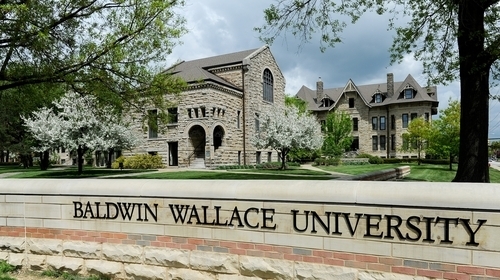 Garfield High School graduate, Simeon Brown ('14) completed a personalized research project through the Baldwin Wallace University Summer Scholars Program. Coordinated by BW's Undergraduate Research and Creative Studies (URCS), the 10-week program provided a funded opportunity for BW students to pursue projects of their own design in the context of an intellectual community that shares seminars, field trips and access to other scholars within and beyond the University. Brown, a 2014 graduate of James A. Garfield High School, is majoring in instrumental performance and music history and literature, was one of nine students selected for the elite experience. With the mentorship of Dr. Danielle Kuntz, Brown conducted research on a project titled, "Modernizing Motets: Bringing New Life to Old Music in the Riemenschneider Bach Institute." Brown had this to say about the project, "The primary goal of this project is to catalogue the motets contained in the Novi Thesauri Musici, in order to categorize and analyze the voicing in the pieces. Another goal is to complete a transcription and translation of one to three motets, in order to analyze specific works from theoretical and textual perspectives." The students will give their final research presentations in April at the Summer Scholars "Passing the Torch" ceremony as part of the 2018 Ovation Festival, BW's annual celebration of student achievement. Summer Scholars is one of many opportunities URCS offers, enabling partnerships between students and professors for a creative, hands-on approach to learning. Summer Scholars are awarded a $3,500 stipend, free summer housing and up to $500 to pay for supplies, services and/or travel in direct support of their research projects. Faculty mentors work closely to challenge, guide and support student researchers.